Paper is a wonderful tool for crafting awesome things. If you have kids you may already know: You can fold paper and cut out creative patterns like snowflakes or flowers. We took this paper art as example for our PowerPoint templates and created a new slide set with amazing paper cut graphics. They elegantly combine playful paper art with daily business life. You may have not seen something like this in business before: A PowerPoint presentation arranged with graphics reminding of elaborate paper scraps and paper cuts. So be the first to amaze your audience with extraordinary visual effects. Illustrate business related data, facts and figures on a completely new level. Use snippets with shapes of leaves or water drops or even with stylized speech bubbles, arrows, and puzzle pieces to spice up your speech. All paper cut graphics are perfectly suitable to present information compact and well-arranged. During the development of the templates it was important to us to create a diversified collection of graphics and themes of which you will benefit in your daily business life and you can easily use for multiple purposes. Therefore, we put maps, bar diagrams, speech bubbles, symbols of paragraphs, like and dislike thumbs, bulbs, arrows, puzzle pieces, snowflakes, rack-wheels, airplanes and even fruits in one slide set. To avoid each slide of being crammed with too much information we took care of ensuring an appropriate balance between text placeholders and graphical elements. Always focus on the maxim ‘less is more’. Just let pictures tell their stories instead of using too much text on a slide. 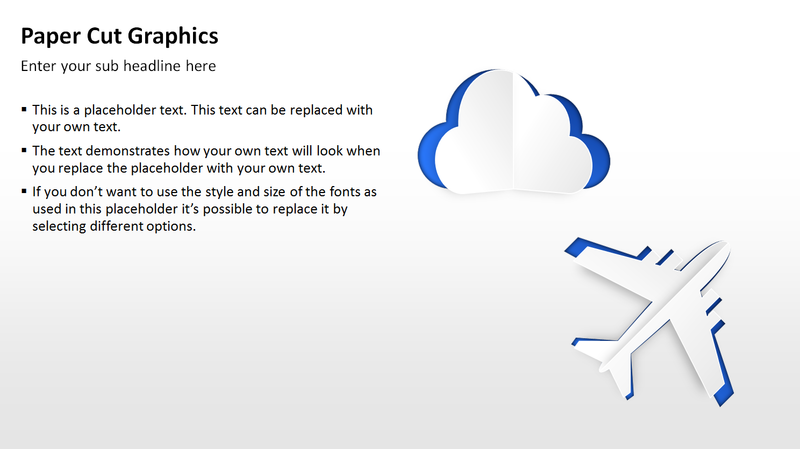 The symbolic graphics will underline your statements perfectly. Some examples: Easily illustrate goals and success orientation with ascending arrows while you are talking about detailed facts. 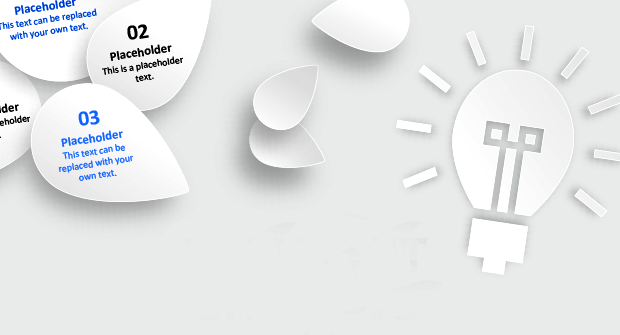 The light bulb is the best symbol to illustrate the introduction of a new idea completely without text.